Baan Bovorn locates right in front of Wat Bovornnives, the royal temple of Thailand and Banglumpoo, the old charming local shopping area. From the hostel, within a few minute walking distances, you can reach all major attractions like the Pra-Arthit Pier, Grand Palace and even night life in Khaosan Road. 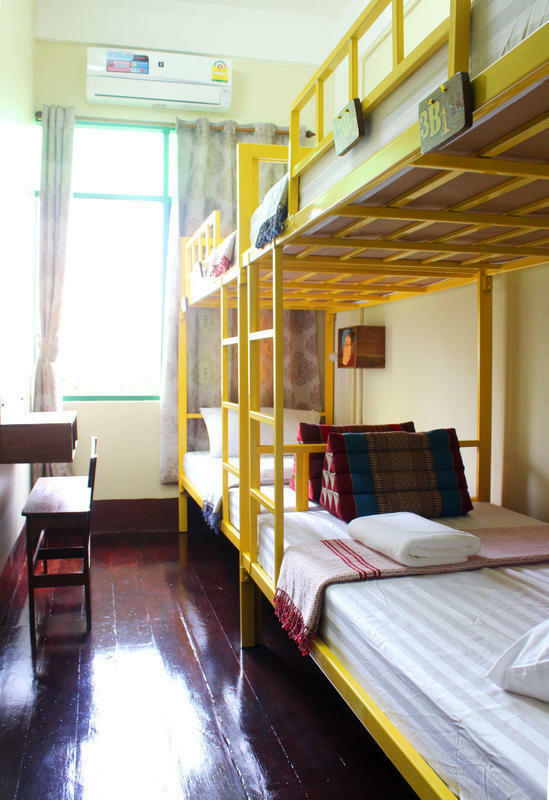 Enjoy our warm contemporary comfort hostel when you stay in this newly renovated historic property, which was built over 40 years ago. Feel the charming Thai artisan and cozy style in our setting while visiting our unique local life style and stay in Banglumpoo, old town Bangkok, surrounding with international & Thai food stalls and shops. Enjoy our hostel services. With a limited number of rooms, we do our friendly services for all guests and present them how to enjoy our lovely Thailand. Our deluxe lady and mixed dorms are clean and air conditioning. All rooms include breakfast, free WIFI, towels, linens and luggage storage service. For your option, we also serve fresh gourmet coffee, beer, fruit and sandwiches at our cafe. Our hostel is not suitable for children under 12 years old. Reception service starts from 7:00 - 22:00. Due to Thai legal, all hostels are non smoking zone.